Almost complete. The boys turned up on a sunny Saturday afternoon to put the finishing touches to the horse. 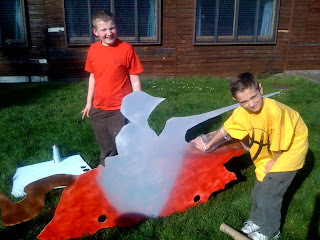 They loved spray painting - it was almost as if they'd done it before some place else.. !? Read about the winning success of the St George's Day Jousting Competition. 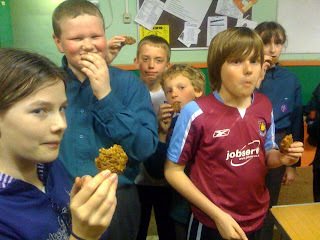 Besides making a plywood cut out of a jousting horse for St George's Day, we also made ANZAC biscuits. ANZAC day remembers those in the Australian and New Zealand Army Corp who fought in the 1st World War. 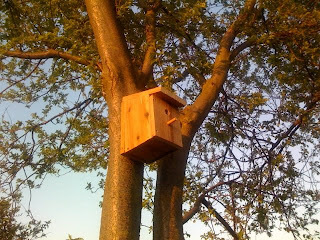 My nephew and I built a bird box last weekend. He wanted me to put it in my garden, so here it is. I'd quite like to refocus the webcam on the box to capture any comings and goings.